The refreshened RLX gets Acura's new diamond-pentagon grille outside and updated materials in. LOS ANGELES — Tucked in the corner of Acura’s portfolio, behind the hot-selling crossover duo of the MDX and RDX, the poster-worthy NSX hybrid supercar and the refreshed TLX sedan, is the lonely RLX. The luxury sedan is one of the least popular Acura models in Canada. Introduced for the 2014 model year, the RLX, has sold fewer than 800 units total. This year has been particularly brutal: 41 sales through July, down 39 per cent from a year earlier. It’s a similar story in the United States. The flagship luxury sedan of American Honda has sold fewer than 13,000 units total since it was introduced. This year, the automaker has sold 619 through July, down 26 per cent compare with last year. The updated RLX is set to go on sale in in Canada in November. Pricing hasn’t bee announced. With a refreshed model for 2018, Honda is looking to pump some life back into its premier car. The updates include new sheet metal at the front and rear, and Acura’s new diamond-pentagon grille replacing the unloved metal-beak look. There are upgraded materials inside the car, a new 10-speed automatic transmission on the base V-6 version and a simpler trim structure. But with so few sales and an abundance of ultra-sharp competitors in the segment from the United States, Europe and Japan, why does Acura bother? For one thing, Acura and General Manager Jon Ikeda still believe in the importance of sedans, despite the industry shift toward crossovers. 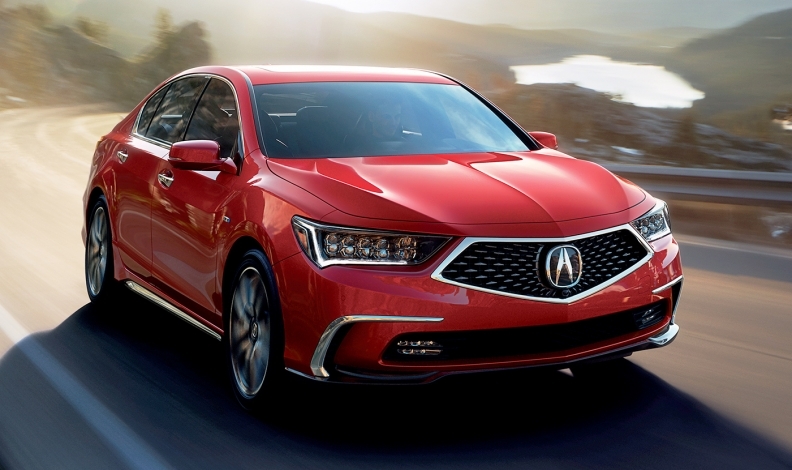 Under Ikeda’s watch, Acura has also embarked on a push into the performance side of the market, amping up its messaging under the tag line “Precision Crafted Performance,” a throwback to Acura’s launch in the late 1980s. A large car at the top of the sedan lineup helps reinforce this point, especially if Acura can connect the dots between the powertrain in the RLX Sport Hybrid and that of the roughly C$200,000 NSX hybrid — as much of a stretch as that may be. From there, Acura hopes, the halo effect will trickle down to the higher-volume ILX and TLX sedans. A simplified trim structure ­— one trim for the base V-6 model and one for Sport Hybrid — has Acura hoping more buyers will see the Sport Hybrid as a worthwhile option over competitors known for their sportiness. Acura expects the Sport Hybrid to make up a significantly higher mix of RLX sales with the 2018 model. Acura’s Sport Hybrids use an electric motor attached to the driveshaft to boost power. Beyond this midcycle refresh, the RLX (or something like it) does have a future within the Acura lineup, Ikeda hinted, though he wouldn’t outright guarantee its return for the next generation.